The player is expected to join Bayern Munich in coming days. Chelsea finally have a solution to their striker problem. The Blues after month’s speculation have signed Gonzalo Higuain on loan from Juventus. Higuain’s arrival might help Chelsea to score more goals. Chelsea scored the least number of goals in top 4 this season. Higuain’s arrival meant Callum Hudson Odoi could be on his way out. Odoi made shocking confession to his friends before Chelsea’s F.A Cup clash. 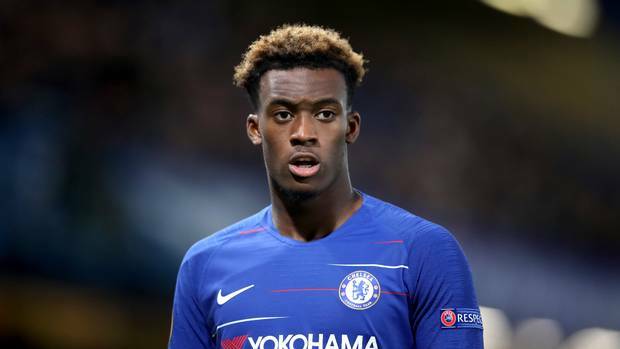 Callum Hudson Odoi has reportedly told friends he does not want to play for Chelsea against Sheffield Wednesday. Hudson-Odoi, who has 18 months left on his contract, wants to leave Stamford Bridge over a perceived lack of chances after Sarri. The 18-year-old has made 10 appearances this season but made no starts in the league. He made a 10 minute in last Saturday’s Premier League defeat to Arsenal. Odoi was an unused substitute in the midweek clash with Tottenham as Chelsea reached the Carabao Cup final. Bayern Munich lead the race for Hudson-Odoi and have made an offer of around £35million for him. But Chelsea are reluctant to let the academy product leave. However, according to the Daily Mail, Hudson-Odoi’s unhappiness with his current situation has seen him admit to pals that he didn’t want to play for the club against Wednesday in the FA Cup. But the report says Sarri will name the teen in his starting lineup. Hudson-Odoi is also understood to have handed in a transfer request in a bid to force through a move away from west London. It’s amazing to think that he’s not even made a Premier League start yet but he’s in demand. It simply tells Chelsea haven’t learnt from their past mistakes. They sold Salah, Cuadrado and De Bruyne instead of developing them. Bayern is the right move for Odoi and it seems not only Chelsea but Premier League is no place for a promising youngster at a top club. Adrien Rabiot rejects Tottenham move and would rather join this Premier League side!